Clare graduated from the Ontario Veterinary College in 1975. 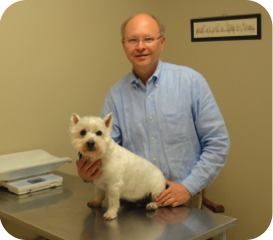 He moved to the Stirling area and started Stirling Veterinary Services in 1978. Clare believes in offering the best level of care for his patients and in doing so, is a strong advocate for preventative care nutrition. His special interests include Internal medicine and preventative health programs including wellness testing. Clare has also held a position on the CVO regulatory committee for 10 years. This committee works to ensure high ethical standards are upheld within the veterinary profession. fact, it’s not uncommon to see a couple of the Craig’s helping out with those late night c-sections! In his spare time, Clare keeps busy caring for his 2 cats, Momma puss and Skittles. He is also an avid gardener and enjoys an afternoon of golfing, kayaking or hiking around the lake.